Squaw Valley Northface Guides with a group. Photo courtesy Squaw Valley. As we wind down the ski season, here’s a post to inspire you for next year! If it appeals, it’s an experience for the bucket list. There are some mountains that don’t give up their secrets easily. Squaw Valley is one of them. It’s not that it’s hard to find your way around Squaw Valley, or that you can’t find great skiing and riding on your own. You can. And we have. But, you just know there’s a lot more out there. This season Squaw Valley|Alpine Meadows introduced the North Face Mountain Guides program. Staffed by mountain insiders who know every aspect, cliff, hike and climb, the guide program is designed to help skiers with intermediate skills and above ski these mountains like never before. Currently, there are five guides who lead groups of four on day-long adventures at both Squaw Valley and Alpine Meadows. The program is open to skiers and riders ages 13+, with intermediate and higher skills. Like a cat or heli-ski trip, it’s important that your group have similar abilities so that no one is left waiting and no one feels pressured to keep up. In addition to taking your group to amazing hike-to lines, guides are also skilled at giving tips, and helping clients ski and ride better on challenging terrain. The cost for up to four people is $695 if booked in advance (which you need to do anyway). At the end of the day, not only will you have skied lines you never imagined, but everyone in your group will receive a brand-new Thermoball jacket from The North Face (retail value $199.00). You’ll have the ski day of a lifetime and be money ahead with a new jacket. My son and I skied Squaw Valley on a windy, snowy February day. The mountain was on hold until 1:30 p.m. when we went out with our guide, Billy Haupert. While we had dreams of skiing KT-22 on a deep powder day, it didn’t happen, because KT-22 didn’t open. KT 22 Two days later. Good morning! Good fun. Instead, Billy took us to three lower mountain lifts we’d never before skied: Red Dog, Far East Express and Squaw Creek. Skiing with Billy, we quickly learned that we needed to ski the steepest aspects possible to keep our momentum in the heavy snow. He totally delivered, directing us to lift line steeps and through long shots of glades. He also gave tips for skiing the rather “solid” Sierra snow, as well as the 411 on runs, helping us choose lines and avoid cliffs. The day we skied with Billy was like this. Still, we got an idea of what the guide service would be like. And it is good. Best of all, we got to cut long lift lines. And while my photos from that day aren’t very inspiring, we returned to ski Squaw Valley a few days later. It was a classic California ski day — sunny, warm and not at all crowded. We revisited some of our favorite lifts and lines. But I kept wondering “where would Billy take us?” We’ll have to come back to find out. You Gotta Go Ski Squaw Valley, USA, November 11, 2013. 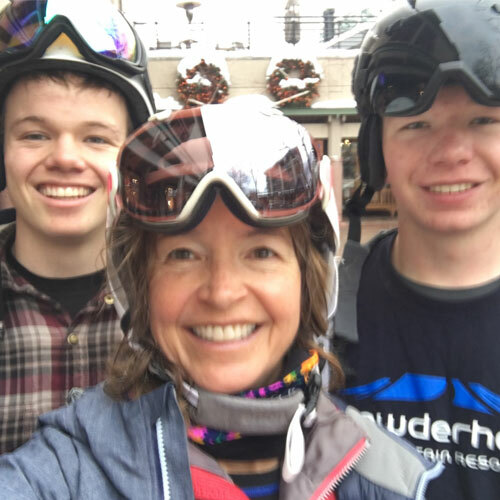 Family, Traditions and Skiing: Northstar California Resort, March 16, 2016. Spring Break at Sierra-at-Tahoe, California, March 10, 2014. Mammoth, California: Worth the Drive and More, December 16, 2013. SoCal’s Mountain High Ski Resort Goes Family Friendly, November 1, 2013. Why My Family Loves to Ski Snow Valley, California, December 31, 2012. California Dreamin’, Part Two: Ski Heavenly, October 8, 2012. Why My Family Loves Skiing at Big Bear Mountain Resorts, September 27, 2011.